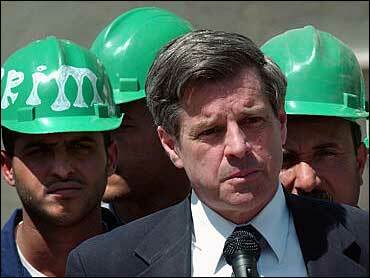 Paul Bremer, who ran the Coalition Provisional Authority (CPA) after the United States' 2003 invasion of Iraq, is now a ski instructor in Vermont, according to the website Task and Purpose. "I specialize in fear," Bremer, who is 76 and teaches skiing at the Okemo Mountain Resort, told the website. "Taking it away." Bremer says that while many view his role as instrumental in the country's descent into chaos, he has few regrets about his role in the occupation. "The Iraqi people are infinitely better off today out from under Saddam, even after all the problems that admittedly are there," he told Task and Purpose. "And they have the men and women of our armed forces and elsewhere to thank for it." After a distinguished career in government, Bremer was tapped by President George W. Bush's administration to become the top U.S. civilian in Iraq following the invasion, and was charged with administering "all executive, legislative and judicial functions" in the country. In that capacity, Bremer banned all members of Saddam Hussein's Baath Party from government jobs and disbanded the Iraqi military. Both moves are now widely seen as crucial missteps that helped sustain a bloody insurgency against U.S.-led coalition forces. Before his fall from grace, however, Bremer was though to be a contender for a cabinet post in the Bush administration. The former CPA leader recalled receiving a note from former Secretary of State Colin Powell joking about how Bremer was gunning for his job in the months following the invasion. "When I get out of here — if I ever get out of here — I'm going to Vermont and I'm going to show you a Rip Van Winkle act like you've never seen," Bremer replied at the time. "I'm going to sleep for years." In keeping with that statement, Bremer now lives a quiet life in Vermont, and even replies to hate mail sent to his address. "He still answers hate mail," his wife told the website. "People will say, 'Do you consider yourself a war criminal?' Or 'Why don't you go commit harakiri?' Nice things like that. But I think he's much more at peace now. We both are." For the apres-ski portion of the interview, Bremer cozied up with an espresso in his Vermont home, donned in a comfortable wool sweater, turtleneck, and slippers. "I knew how the game was played, and I realized I was going to be vulnerable," he told the website. "But I wasn't looking to protect myself. When you get to a position like this, you do what you think is right, or you resign and take the consequences."